The scope of the appetite for regulated sports betting has become quite evident. Less than a month into the new year, half of all US states are considering legalization or expansion of their current offerings. The chatter is brisk enough that we’re starting a new weekly roundup, one that’s entirely separate from our standard weekly rundown. This one is for like-minded fans of the policymaking process, focusing exclusively on legislative and regulatory developments. By the time you finish reading those words, that list will probably be out of date. New bills appear pretty much every day, including several fresh ones already this week. Let’s run through some of the recent movements, shall we? Reminder: We update our 2019 sports betting bill tracker daily to try to keep up with the momentum. As one of the focal points of the sports betting dialogue last year — and one of the largest markets in the country — our eyes have been fixed on Illinois for quite some time. This week, the first IL sports betting bill for 2019 appeared on the docket. Former NFL player and current Sen. Napoleon Harris reintroduced his 2018 legislation, about which we’ve written many words in the past. It is a league-friendly bill which includes provisions for an integrity fee and controls over approved data sources. Expect to see additional, competing efforts in the near future. Three new study bills also appeared in Iowa this week covering three possible implementations for IA sports betting — either via the state lottery or the licensed gambling facilities. One of the bills clearly originates with the leagues, as it includes the full list of provisions they seek. See the bills here, here, and here. And lastly, New England is now fully colored-in with the additions of bills in Vermont and Maine. They’re young, timid proposals for the time being. The one in Vermont is a study bill, while the Maine bill is nothing more than a placeholder for now. The Empire State changed colors on our tracker, going from blue to yellow to signal the impending launch of NY sports betting. During a scheduled meeting this week, the New York State Gaming Commission initially approved a set of rules to govern the industry. As expected, they restrict wagering to the four upstate casinos authorized to operate sportsbooks under a 2013 law. There are no provisions for online/mobile betting. At least two lawmakers think that could change this year, though. Assemblyman Gary Pretlow and Sen. Joseph Addabbo chair the gaming committees in their respective chambers, and both think they can bring the industry online without a constitutional amendment. Addabbo recently told LSR that it may not even require more legislation. The two chairs intend to present legal opinions to the governor’s chief counsel for consideration in the near future. Addabbo indicated that the inclusion of league fees is among the “moving parts” of his proposal. Incidentally, MGM also received licenses to operate Empire City Casino this week, but its new property in Yonkers is not approved for sports betting under existing law. As you can tell by glancing at the map, the landscape is filling in fast with legislative appetite. Here’s a quick tour through some of the other newsworthy items this week, including a few from jurisdictions with laws already in place. District of Columbia: The council will soon vote on a proposal to bypass the competitive bidding process for the DC Lottery contract, including sports betting operations. On Monday, city officials testified for hours in support of hiring Intralot to fast-track the launch of DC sports betting under their preferred supplier. Mississippi: The MS sports betting industry is off to a fast start despite a standing prohibition on remote betting. A new bill moves to remedy that, however, by expanding the definition of “platform” to include statewide online/mobile wagering. New Jersey: Though somewhat minor, this one is worth a quick mention. A new NJ sports betting bill moves to codify penalties for operators that book action on unapproved games, including a license suspension of up to 10 days. Oregon: Considering their state had a pre-PASPA sports lottery in place, officials believe they can expand into single-game wagering without additional legislation. 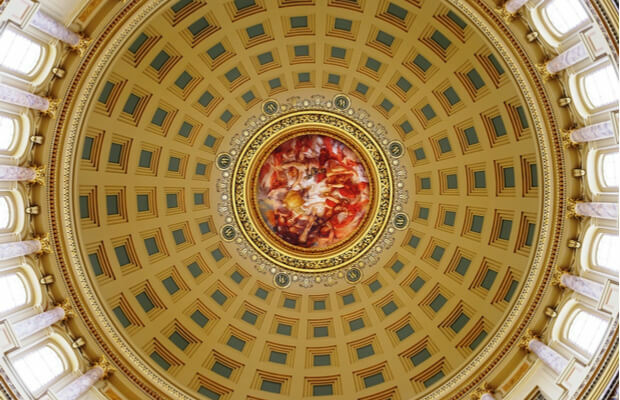 A new bill has appeared in the statehouse dealing with the allocation of related revenue. South Dakota: Joining their northerly neighbors, lawmakers in the southernmost Dakota have proposed legalized sports betting. A joint resolution would allow the legislature to authorize retail sportsbooks at the Deadwood casinos, provided voters approve. Virginia: None of the seven bills on file related to VA sports betting appear likely to pass this year. The Senate slowed its roll on a bill in Finance this week, and sources tell us to expect similar resistance in the lower chamber. Lawmakers will only be working in Richmond until their short session expires on Feb. 23. That’s all for this week, ladies and gentlemen. Check the map often for new additions, and follow @LSPReport on Twitter for real-time updates.